Well, I am headed off on another trip overseas, and my time has been taken up with packing and finishing off some projects, so I don't have a review today. Instead, I have a poem, and an announcement. The announcement comes first. 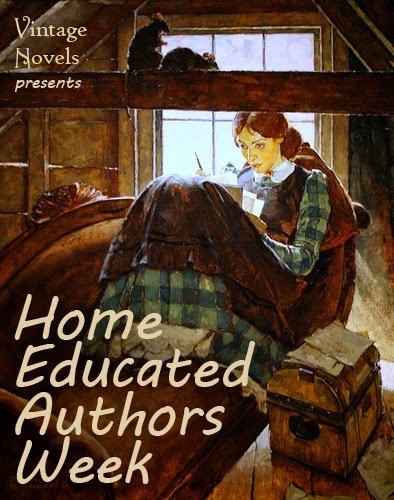 We haven't run a feature week here at Vintage Novels for a little while, but I've been cooking something up lately, and I'll be thrilled to present--Deo volente and as soon as I get home and have the time--a whole new feature week dedicated to contemporary home educated authors! 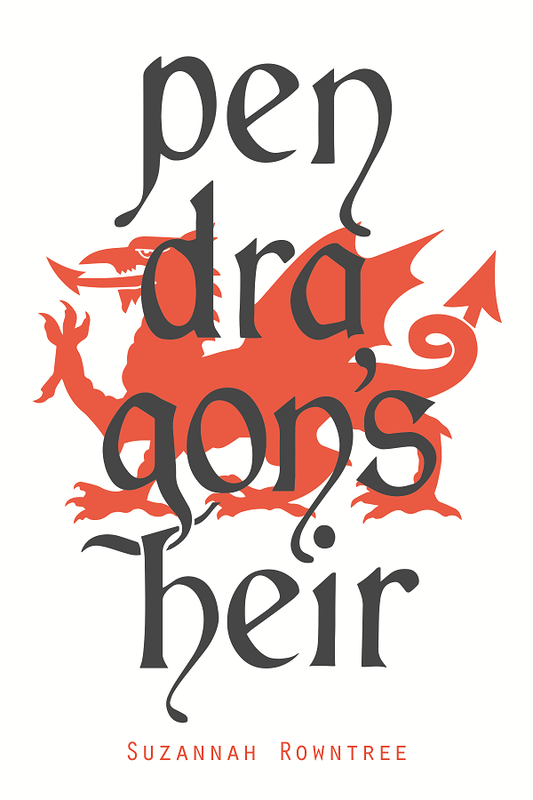 There'll be reviews, there'll be interviews, there'll be some really wonderful books to discover. I'll be talking to an array of folks from our old friend John J Horn to the amazing and talented KM Weiland of Helping Writers Become Authors. Check back in a couple of weeks for more news! A small circle is quite as infinite as a large circle; but, though it is quite as infinite, it is not so large. In the same way the insane explanation is quite as complete as the sane one, but it is not so large. [...] There is such a thing as a narrow universality; there is such a thing as a small and cramped eternity; you may see it in many modern religions. As we have taken the circle as the symbol of reason and madness, we may very well take the cross as the symbol at once of mystery and of health. Buddhism is centripetal, but Christianity is centrifugal: it breaks out. For the circle is perfect and infinite in its nature; but it is fixed for ever in its size; it can never be larger or smaller. But the cross, though it has at its heart a collision and a contradiction, can extend its four arms for ever without altering its shape. Because it has a paradox in its centre it can grow without changing. The circle returns upon itself and is bound. The cross opens its arms to the four winds; it is a signpost for free travellers. [T]here is nothing in the least liberal or akin to reform in the substitution of pure monotheism for the Trinity. The complex God of the Athanasian Creed may be an enigma for the intellect; but He is far less likely to gather the mystery and cruelty of a Sultan than the lonely god of Omar or Mahomet. The god who is a mere awful unity is not only a king but an Eastern king. [...] If this love of a living complexity be our test, it is certainly healthier to have the Trinitarian religion than the Unitarian. For to us Trinitarians (if I may say it with reverence)—to us God Himself is a society. It is indeed a fathomless mystery of theology, and even if I were theologian enough to deal with it directly, it would not be relevant to do so here. Suffice it to say here that this triple enigma is as comforting as wine and open as an English fireside; that this thing that bewilders the intellect utterly quiets the heart: but out of the desert, from the dry places and the dreadful suns, come the cruel children of the lonely God; the real Unitarians who with scimitar in hand have laid waste the world. For it is not well for God to be alone. To the last low woods of Sussex and the road that goes to Rye. And the huts were heedless of me: and I knew I was at home. That usher with iron laughter the coming of Christian arms. 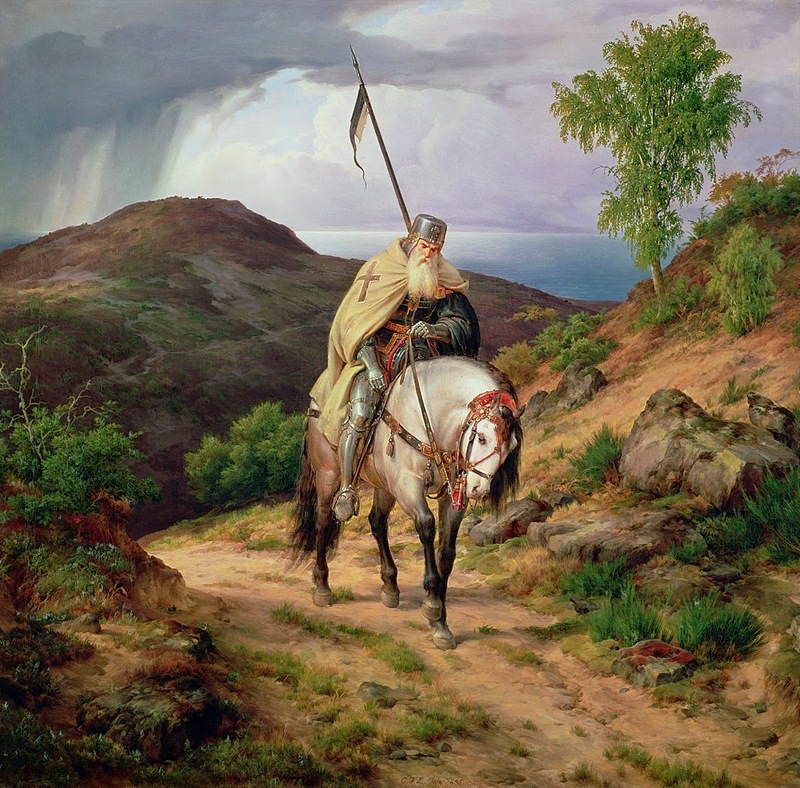 A sword is still at my side, but I shall not ride with the King. A day with the stone and the sparrow and every marvellous thing. The wild white cross of freedom, the sign of the white cross-roads. As long as I walk in England in the lanes that let me pass. Thanks so much to all of you for participating. 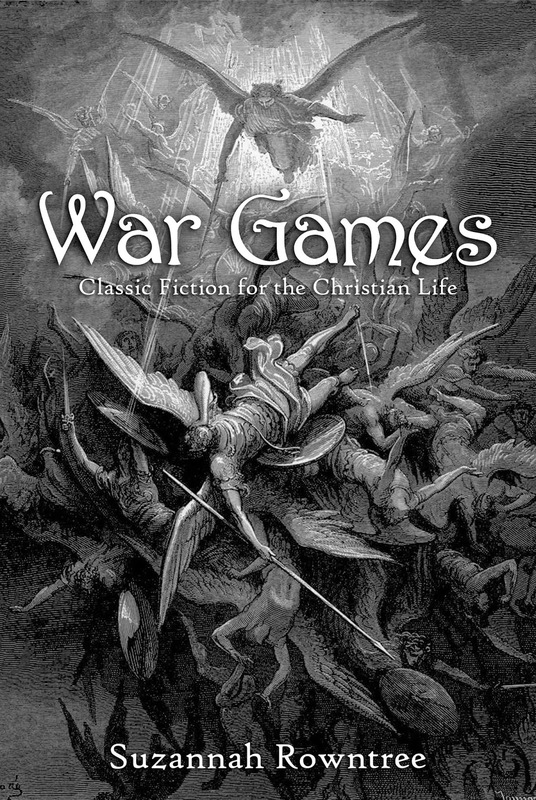 I'll be in touch with the winners via email with your coupon for the free copy of War Games: Classic Fiction for the Christian Life. Hello, friends! Today I'm excited to announce a shiny new book, now available in ebook and paperback format! Family and church reformation as a cure for social ills. Christian boldness in the face of totalitarianism and modernism. Sacrificial love in the City of God. Sure, you’ve heard of these classic books already. You might even have seen the movies. But have you caught the vision? Fiction with a solid Christian worldview drills us in right action and reaction in a host of different circumstances. It runs war games for the Christian life, showing how wisdom might apply in hypothetical scenarios. It prepares us for battle. 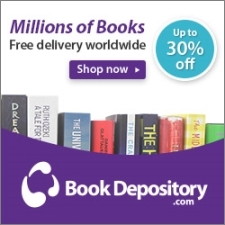 Sure, you can read reviews of all these books right here on Vintage Novels for free. But for War Games, I've taken all those reviews and revised, expanded, and updated them. Each chapter of War Games contains exciting all-new material. I'm particularly thrilled about the Njal's Saga chapter--who would have expected to find common ground between an anonymous Icelandic scholar and...RL Dabney? War Games was a blast to write, and I hope you'll love reading it as much as I did! As with The Epic of Reformation, War Games will be available from Amazon for Kindle, from Createspace as a paperback, and from Smashwords in a host of e-formats. Both the paperback and the ebook will be distributed widely--for instance, you should be able to get the ebook from Apple, Kobo, Nook, and so on, the paperback will be available from Amazon, from The Book Depository, and other places. It could take a few days to show up in these other channels. 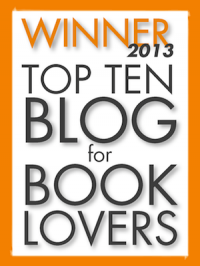 I'm giving away 5 copies of the War Games ebook! Enter below! I've been hard at work on a couple of exciting projects which I hope to bring to Vintage Novels fairly soon (let's just say I've been hard at work reading a whole bunch of fun new novels), so this is going to be a short, light review! Like most folks, I enjoy a good mystery/suspense yarn, preferably without too many details to keep track of, since I have a hard enough time remembering where I was at 11.17 on the morning of Tuesday the thirteenth let alone a raft of suspicious fictional characters. Mary Stewart's tales are always a favourite, but I don't have a lot of them left to read, and so I have been sniffing around for a replacement. I'm not yet sure MM Kaye will hit the spot. Death in the Andamans is the first in a classic series of murder mysteries set in exotic locations. On a tiny cluster of gorgeous but spooky islands in the Bay of Bengal, the Governor's stepdaughter schedules the usual Christmas outing for the usual tiny group of guests. When a storm threatens, the partygoers just make it back to the mansion in time, but not before a boat capsizes, drowning one of them. One of the guests goes into hysterics and footsteps slink through the house after midnight, but not until another guest vanishes does anyone say the word murder...Copper Randall and her chum Valerie decide to investigate before more people die. This was a pretty enjoyable old-school murder mystery. There was a bit of suspense, a bit of romance, and a bit of humour. The setting is lovingly and vividly described, though not as evocative as a Mary Stewart novel. Ironically, for a book I didn't love, one of the complaints I have is something the author did very well. Some passages were legitimately creepy and atmospheric, a little too much so for my liking, and I wasn't a fan of the "ghost" in the first chapter (though the author says she had a similar experience during her holiday on the Andamans). I also felt that the romance was a little clunky--the author throws in a rather obvious red herring pointing at Copper's crush--and was underwhelmed by the identity of the murderer, once it was revealed. Combine these things with a relatively slow-moving plot, and as I said, I didn't love it. Overall, the book wasn't a huge miss. With just some slight tweaks, I might have loved it, and I'll certainly be looking up the next book, Death in Berlin, at some future date. 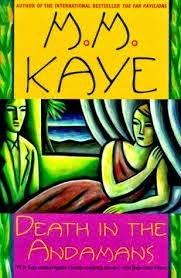 Interestingly, this isn't the first of MM Kaye's books that I've read. Years ago I read and loved a fun little children's book called The Ordinary Princess. I'm not sure how well it would stand up to a re-read, but it struck a chord, and it turns out to have been written by MM Kaye. Get Death in the Andamans from Amazon, the Book Depository, or Open Library.